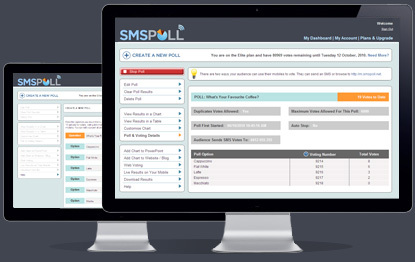 SMS Poll is the easiest and fastest way to find out what your audience is thinking. Requiring no special hardware or software, you can create a live poll in just a few seconds. Your audience votes by sending an SMS or Web Voting from their device, computer or mobile phone. 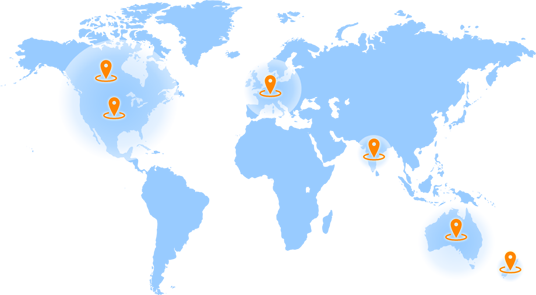 Results are updated and displayed before their eyes, in real-time, in your PowerPoint presentation, or on your website. SMS Poll is used across a wide variety of industries and professions. We are the preferred choice over traditional Audience Response Systems that are expensive and time poor. Learn more about the applications of SMS Poll. unlimited polls and have your first poll created in seconds. With SMS Poll there are no lock-in fees or fixed contracts. You can purchase a higher plan if you need more votes and then downgrade once the poll has finished. SMS Poll is the easiest and fastest way to find out what your audience is thinking.Simple setup and powerful insight.Engage your audience today. Researchers,Not For Profits, Corporations and more..
UK, Europe, US, Canada and India. Try a live demo. SMS Poll provides a cost effective and innovative tool that allows us to get feedback from our employees in real time. We've used SMS Poll at a number of our events and particularly like the interactivity and buzz they create as the feedback starts trending through on the online charts. We were after a live SMS polling system which we could set up and easily manage ourselves on the night of a major company event, and SMS Poll provided this. They were cost effective, easy to work with and flexible to accommodate our customised polling needs. As an incred-a-bull part of CowParade Margaret River’s marketing campaign, SMS Poll helped moooo-ve visitors to participate and interact with the cow art by voting for their favourite bovine over the four month period. A moovellous tool for generating public interest and evaluating the success of the event. SMS Poll allowed the 2010 Gertrude St Projection Festival to increase our interaction with the over 4000 visitors. SMS Poll was a major sponsor of the Festival tailoring an interactive poll for 64 art works and achieving our 2010 goal of launching a successful people's choice award. 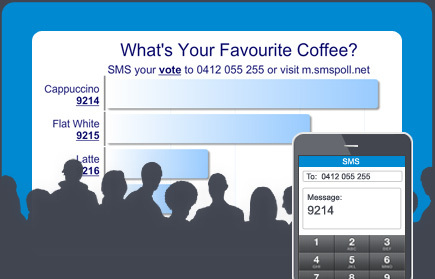 We are excitedly integrating SMS Poll into our Masterclass Training and Debate series. We know it will help generate a more interactive and deeply processed learning experience – helping ensure that more Australian fundraisers go forth and change the world. SMS Poll is so good it made we want to lick the screen. There are so many applications and we’ll definitely be introducing it into our service offerings plus featuring it as a platform to explore and utilise with our clients.